The Jew's harp, also known as the jaw harp, mouth harp, Ozark harp or juice harp, is a lamellophone instrument, consisting of a flexible metal or bamboo tongue or reed attached to a frame. The tongue/reed is placed in the performer's mouth and plucked with the finger to produce a note. Each instrument produces one pitch only, with its multiples (overtones), though different sized instruments provide different pitches. There is no standard pitch. Jew's harps may be categorized as idioglot or heteroglot (whether or not the frame and the tine are one piece), by the shape of the frame (rod or plaque), by the number of tines, and whether the tines are plucked, joint-tapped, or string-pulled. The frame is held firmly against the performer's parted teeth or lips (depending on the type), using the jaw and mouth as a resonator, greatly increasing the volume of the instrument. The teeth must be parted sufficiently for the reed to vibrate freely, and the fleshy parts of the mouth should not come into contact with the reed to prevent damping of the vibrations and possible pain. The note or tone thus produced is constant in pitch, though by changing the shape of the mouth, and the amount of air contained in it (and in some traditions closing the glottis), the performer can cause different overtones to sound and thus create melodies. According to the Encyclopædia Britannica Eleventh Edition, "The vibrations of the steel tongue produce a compound sound composed of a fundamental and its harmonics. By using the cavity of the mouth as a resonator, each harmonic in succession can be isolated and reinforced, giving the instrument the compass shown." "The lower harmonics of the series cannot be obtained, owing to the limited capacity of the resonating cavity. The black notes on the stave show the scale which may be produced by using two harps, one tuned a fourth above the other. The player on the Jew's harp, in order to isolate the harmonics, frames his mouth as though intending to pronounce the various vowels." See: bugle scale. The earliest depiction of somebody playing what seems to be a Jew's harp is a Chinese drawing from the 4th Century BCE. Archaeological finds of surviving examples in Europe have been claimed to be almost as old, but those dates have been challenged both on the grounds of excavation techniques, and the lack of contemporary writing or pictures mentioning the instrument. Despite its common English name, and the sometimes used "Jew's trump", it has no connection with Jews or Judaism. This instrument is native to Asia and used in all tribes of Turkic peoples in Asia, among whom it is variously referred to as a temir komuz (literally, iron komuz), agiz komuzu (literally, mouth komuz), gubuz or doromb. Although this instrument is used by lackeys and people of the lower class, this does not mean it is not worthy of consideration by better minds ... The trump is grasped while its extremity is placed between the teeth in order to play it and make it sound ... Now one may strike the tongue with the index finger in two ways, i.e., by lifting it or lowering it: but it is easier to strike it by raising it, which is why the extremity, C, is slightly curved, so that the finger is not injured ... Many people play this instrument. When the tongue is made to vibrate, a buzzing is heard which imitates that of bees, wasps, and flies ... [if one uses] several Jew's harps of various sizes, a curious harmony is produced. The instrument is known in many different cultures by many different names. The common English, apparently anti-Semitic name "Jew's harp" is avoided by some speakers or manufacturers. (For example, a tie-in Jew's harp from the movie A Boy Named Charlie Brown was sold as "Snoopy's Harp" instead.) Another name used to identify the instrument, especially in scholarly literature, is the older English "trump", while "guimbarde", the French word for the instrument, can be found in unabridged dictionaries and is featured in recent revival efforts. The temir komuz is made of iron usually with a length of 100–200 mm and with a width of approximately 2–7 mm. The range of the instrument varies with the size of the instrument, but generally hovers around an octave span. The Kyrgyz people are exceptionally proficient on the temir komuz instrument and it is quite popular among children, although some adults continue to play the instrument. There is a National Artist of Kyrgyz Republic who performs on the instrument, temir komuz. One time twenty Kirgiz girls played in a temir komuz ensemble on the stage of the Bolshoi Theater in Moscow. Temir komuz pieces were notated by Zataevich in two or three parts. Apparently an octave drone is possible, or even an ostinato alternating the fifth step of a scale with an octave. There are many theories for the origin of the name Jew's harp. According to the Oxford English Dictionary, this name appears earliest in Walter Raleigh's Discouerie Guiana in 1596, spelled "Iewes Harp". The "jaw" variant is attested at least as early as 1774 and 1809, the "juice" variant appeared only in the late 19th and 20th centuries. Both theories—that the name is a corruption of "jaws" or "jeu"—are described by the OED as "baseless and inept". The OED says that, "More or less satisfactory reasons may be conjectured: e.g. that the instrument was actually made, sold, or imported to England by Jews, or purported to be so; or that it was attributed to them, as a good commercial name, suggesting the trumps and harps mentioned in the Bible." The angkouch (Khmer: អង្គួច) is a Cambodian jew's harp. It is a folk instrument made of bamboo and carved into a long, flat shape with a hole in the center and the tongue across the hole. There is also a metal variety, more round or tree-leaf shaped. It may also have metal bells attached. The instrument is both a wind instrument and percussion instrument. As a wind instrument, it is placed against the mouth, which acts as a resonator and tool to alter the sound. Although mainly a folk instrument, better-made examples exist. While the instrument was thought to be the invention of children herding cattle, it is sometimes used in public performance, to accompany the Mahori music in public dancing. The instrument, known as morsing in South India, morchang in Rajasthan, or muruchungga in Nepal (where they are common), is part of the rhythmic section in a Carnatic music ensemble. In Sindhi the Jew's harp is called Changu (چنگُ). In Sindhi music, it can be an accompaniment or the main instrument. One of the most famous players is Amir Bux Ruunjho. Known ever since the Roman times, today in Italy the Jew's harp is generally known as scacciapensieri, but the name can be different and change from a region to another one. For example, Sicilian, the Jew's harp is known as the "Marranzanu", and it is a common element of Sicilian folk music. It is also commonly used in contemporary styles to provide a distinctive element of Sicilian identity to Sicilian music. In Calabria it is best known as malarruni, while in the island of Sardinia, the Jew's harp has different names: trunfa or sa trunfa, sona-sona, pippiriolu, pioboi, piaboi, piabò, pia-poa, pio-poi, ribèlvia, libelba, and zamburra. The Jew's harp is frequently to be found in the repertoire of music played by alternative or world music bands. Sandy Miller of the UK-based Brazilian samba/funk band Tempo Novo, plays a Jew's harp solo in the piece Canto de Ossanha. 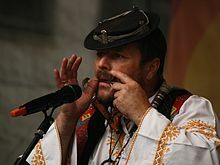 Whereas Jew's harp music is predominantly played with a drone, i.e., the one fundamental note is sounding throughout the playing, the tradition in Austrian folk music since about the 18th century has been to use multiple Jew's harps tuned to the main degree of a diatonic scale that are used according to the chords of the music. Thus, Austrian Jew's harp music uses typical Western harmony. The UNESCO has included Austrian Jew's harp playing in its Intangible Cultural Heritage list. Early representations of Jew's harps appeared in Western churches since the fourteenth century. The Austrian composer Johann Albrechtsberger—chiefly known today as a teacher of Beethoven—wrote seven concerti for Jew's harp, mandora, and orchestra between 1769 and 1771. Four of them have survived, in the keys of F major, E-flat major, E major, and D major. They are based on the special use of the Jew's harp in Austrian folk music. In the experimental period at the end of the 18th and beginning of the 19th century there were very virtuoso instrumentalists on the mouth harp. Thus, for example, Johann Heinrich Scheibler was able to mount up to ten mouth harps on a support disc. He called the instrument "Aura". Each mouth harp was tuned to different basic tones, which made even chromatic sequences possible. Well known performer Franz Koch (1761–1831), discovered by Frederick the Great, could play two Jew's harps at once, while the also well known performer Karl Eulenstein (1802—1890), "invented a system of playing four at once, connecting them by silken strings in such a way that he could clasp all four with the lips, and strike all the four springs at the same time". The American composer Charles Ives wrote a part for Jew's harp in the Washington's Birthday movement of A Symphony: New England Holidays. It is featured prominently in Canned Heat's multi-part piece Parthenogenesis from their Living the Blues album. The Jew's harp provides a distinctive sound for the beginning of The Who's "Join Together". Composer Nobuo Uematsu used a Jew's harp as a drone on the piece written for Final Fantasy VIII's card game. Mukkuri, a traditional bamboo instrument of the Ainu of Japan, similar to a Jew's harp. Musical bow, a one-string harp that is played with mouth resonance. Piperheugh, a village in which trumps were once made. Karinding, a Sundanese traditional musical instrument from West Java and Banten, Indonesia. ^ "Gettysburg: Civil War Collections: Jaw Harp", NPS.gov. ^ Wright, Michael (2004). "The Search for the Origins of the Jew’s Harp", SilkRoadFoundation.org. ^ "Sicilian Item of the day:Marranzano". Siciliamo (blog). 2007-08-10. Retrieved 2008-02-20. ^ Silkroad Foundation; Lee, Adela C.Y. "The Search for the Origins of the Jee's Harp". silkroadfoundation.org. Retrieved 20 June 2015. ^ Slobin, Mark (1969). Kirgiz Instrumental Music. Theodore Front Music. p. 20. ISBN 978-0-614-16459-6. Retrieved February 23, 2014. ^ Timbs, John (1858). Things Not Generally Known: Popular Errors Explained & Illustrated. p. 61. ^ Wedgwood, Hensleigh (1855). "On False Etymologies". Transactions of the Philological Society (6): 63. ^ "Jews' trump, Jew's-trump". Oxford English Dictionary. Oxford University Press. 1989. ^ a b Poss, M.D. "Cambodian Bamboo Jew's Harps". mouthmusic.com. Retrieved 27 October 2018. ... these bamboo Jew's harps are easy to hold and may be longer lasting due to being made of thicker material than many other similar instruments. Held against the lips, they are easy to play and offer the same full, percussive sound as the "Kubings." ^ a b c d e f g Khean, Yun; Dorivan, Keo; Lina, Y; Lenna, Mao. Traditional Musical Instruments of Cambodia (PDF). Kingdom of Cambodia: United Nations Educational, Scientific and Cultural Organization. pp. 146–147. ^ (1999). South Asia : The Indian Subcontinent. Garland Encyclopedia of World Music, Volume 5. Publisher: Routledge; Har/Com. ISBN 978-0-8240-4946-1. ^ sindhi alghozo. YouTube. 9 July 2009. Retrieved 20 June 2015. ^ Tempo Novo - Leamington Spa, Myspace; accessed 23 February 2014. ^ For example, there is a carving of a centaur playing a Jew's harp in the Basel Münster Cathedral. Musiconis Database. Université Paris-Sorbonne. http://musiconis.huma-num.fr/fiche/120/Hybride+jouant+de+la+guimbarde. Accessed January 5, 2018. ^ Maurer, Walter (1983). Accordion: Handbuch eines Instruments, seiner historischen Entwicklung un seiner Literature, p.19. Vienna: Edition Harmonia. ^ Burnley, James (1886). The Romance of Invention: Vignettes from the Annals of Industry and Science, p.335. Cassell. [ISBN unspecified]. ^ Fox, Leonard (1988). The Jew's Harp: A Comprehensive Anthology. Associated University Presses, Inc. p. 33. ISBN 9780838751169. Retrieved 12 May 2015. ^ Graves, Tom (30 April 2015). Louise Brooks, Frank Zappa, & Other Charmers & Dreamers. BookBaby. p. 155. ISBN 978-1-942531-07-4. Retrieved 1 November 2018. ^ Winters, Rebecca Davis (2007). Blind Owl Blues. Blind Owl Blues. p. 159. ISBN 978-0-615-14617-1. Retrieved 1 November 2018. ^ The Who - Join Together. YouTube. 20 March 2010. Retrieved 16 September 2016. Bakx, Phons (1992). De gedachtenverdrijver: de historie van de mondharp. Hadewijch wereldmuziek. Antwerpen: Hadewijch; ISBN 90-5240-163-2. Crane, Frederick (1982). "Jew's (jaw's? jeu? jeugd? gewgaw? juice?) harp." In: Vierundzwanzigsteljahrschrift der Internationalen Maultrommelvirtuosengenossenschaft, vol. 1 (1982). With: "The Jew's Harp in Colonial America," by Brian L. Mihura. Crane, Frederick (2003). A History of the Trump in Pictures: Europe and America. A special supplement to Vierundzwanzigsteljahrsschrift der Internationalen Maultrommelvirtuosengenossenschaft. Mount Pleasant, Iowa: [Frederick Crane]. Emsheimer, Ernst (1941). "Über das Vorkommen und die Anwendungsart der Maultrommel in Sibirien und Zentralasien". In: Ethnos (Stockholm), nos 3-4 (1941). Emsheimer, Ernst (1964). "Maultrommeln in Sibirien und Zentralasien." In: Studia ethnomusicologica eurasiatica (Stockholm: Musikhistoriska museet, pp. 13–27). Fox, Leonard (1988). The Jew's Harp: A Comprehensive Anthology. Selected, edited, and translated by Leonard Fox. Lewisburg: Bucknell University Press; London: Associated University Presses; ISBN 0-8387-5116-4. Gotovtsev, Innokenty. New Technologies for Yakut Khomus. Yakutsk. Kolltveit, Gjermund (2006). Jew's Harps in European Archaeology. BAR International series, 1500. Oxford: Archaeopress; ISBN 1-84171-931-5. Mercurio, Paolo (1998). Sa Trumba. Armomia tra telarzu e limbeddhu. Solinas Edition, Nuoro (IT). Plate, Regina (1992). Kulturgeschichte der Maultrommel. Orpheus-Schriftenreihe zu Grundfragen der Musik, Bd. 64. Bonn: Verlag für Systematische Musikwissenschaft; ISBN 3-922626-64-5. Schlesinger, Kathleen (1911). "Jew's Harp" . In Chisholm, Hugh (ed.). Encyclopædia Britannica. 15 (11th ed.). Cambridge University Press. p. 411. Shishigin, S. S. (1994). Igraite na khomuse. Mezhdunarodnyi tsentr khomusnoi (vargannoi) muzyki. Pokrovsk: S.S. Shishigin/Ministerstvo kul'tury Respubliki Sakha (IAkutiia). ISBN 5-85157-012-1. Shishigin, Spiridon. Kulakovsky and Khomus. Yakutia. Wright, Michael (2008). "The Jew's Harp in the Law, 1590–1825". In: Folk Music Journal 9.3 pp. 349–371; ISSN 0531-9684. Wright, Michael (2015). The Jew's Harp in Britain and Ireland. Farnham, Surrey: Ashgate; ISBN 978-1-4724-1413-7. Yuan, Bingchang, and Jizeng Mao (1986). Zhongguo Shao Shu Min Zu Yue Qi Zhi. Beijing: Xin Shi Jie Chu Ban She: Xin Hua Shu Dian Beijing Fa Xing Suo Fa Xing; ISBN 7-80005-017-3. Paolo Mercurio (2013). Gli Scacciapensieri Strumenti Musicali dell'Armonia Internazionali, Interculturali, Interdisciplinari. Milano; ISBN 978-88-6885-391-4. Wikimedia Commons has media related to Jaw harps. Origins of the Jew's Harp. A popular synopsis of the archaeological findings of Jew's harps combined with an extensive illustrated survey of the world distribution of different types. This page was last edited on 21 April 2019, at 07:27 (UTC).